BLOOMINGTON, Ind. 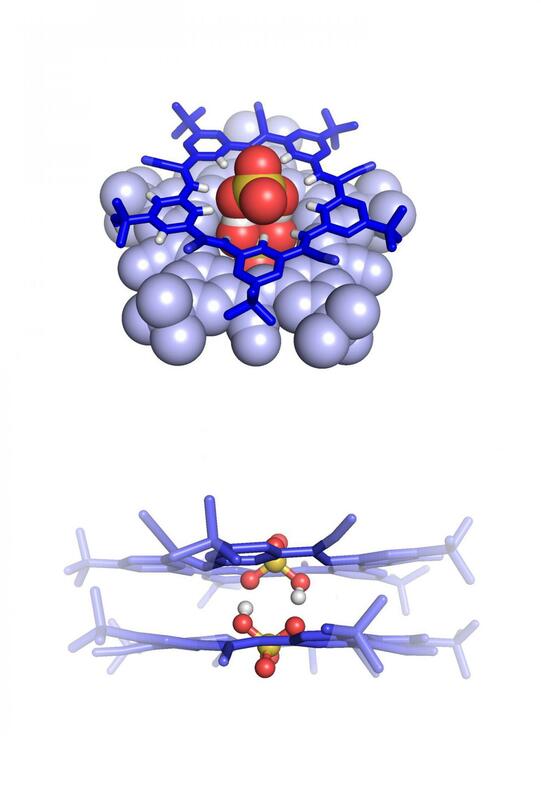 — Indiana University researchers have reported the first definitive evidence for a new molecular structure with potential applications to the safe storage of nuclear waste and reduction of chemicals that contaminate water and trigger large fish kills. The study, which appears online today in the German scientific journal Angewandte Chemie International Edition, provides experimental proof for the existence of a chemical bond between two negatively charged molecules of bisulfate, or HSO4. The existence of this structure — a "supramolecule" with two negatively charged ions — was once regarded as impossible since it appears to defy a nearly 250-year-old chemical law that has recently come under new scrutiny. "An anion-anion dimerization of bisulfate goes against simple expectations of Coulomb's law," said IU professor Amar Flood, who is the senior author on the study. "But the structural evidence we present in this paper shows two hydroxy anions can in fact be chemically bonded. We believe the long-range repulsions between these anions are offset by short-range attractions." Flood is a professor in the IU Bloomington College of Arts and Sciences' Department of Chemistry. The first author on the study is Elisabeth Fatila, a postdoctoral researcher in Flood's lab. In molecular chemistry, two monomer molecules connected by a strong covalent bond are called a "dimer." (A polymer is a chain of many monomers.) In supramolecular chemistry, the dimers are connected by many weak non-covalent bonds. A negatively charged particle is an anion. A key part of Coulomb's law is the idea that two molecules with the same charge create a repellent force that prevents chemical bonding — like two magnets with the same end put into close contact. But recently, experts have begun to argue that negatively charged molecules with hydrogen atoms, such as a bisulfate — composed of hydrogen, sulfur and oxygen – can also form viable chemical bonds. "Although supramolecular chemistry started out as an effort to create new molecular hosts that hold on to complementary molecular guests through non-covalent bonds, the field has recently branched out to explore non-covalent interactions between the guests in order to create new 'chemical species,'" Fatila said. The negatively charged bisulfate dimer in the IU study employs a self-complementary, anti-electrostatic hydrogen bond. The molecule's existence is made possible through encapsulation inside a pair of cyanostar macrocycles, a molecule previously developed by Flood's lab at IU. Fatila and colleagues were trying to bind a single bisulfate molecule inside the cyanostar; the presence of two negatively charged bisulfate ions was a surprise. "This paper is inspirational because it may launch a new approach to supramolecular ion recognition," said Jonathan Sessler, a professor of chemistry at the University of Texas at Austin who was not involved in the study. "I expect this will be the start of something new and important in the field." The ability to produce a negatively charged bisulfate dimer might also advance the search for chemical solutions to several environmental challenges. Due to their ion-extraction properties, the molecules could potentially be used to remove sulfate ions from the process used to transform nuclear waste into storable solids — a method called vitrification, which is harmed by these ions — as well as to extract harmful phosphate ions from the environment. "The eutrophication of lakes is just one example of the serious threat to the environment caused by the runoff of phosphates from fertilizers," Flood said, referring to uncontrolled plant growth that results from excess phosphate nutrients running into lakes and ocean. When these chemicals get into the water supply as runoff from fertilizer — produced by dairy farms and used to increase crop yields — they can trigger massive algae blooms that poison water supplies and kill fish in large numbers. In August, Flood was also named the principal investigator on a new, separate grant from the National Science Foundation to specifically focus on removing these substances from the environment. The three-year, $600,000 award is a collaboration with Heather Allen, a professor at The Ohio State University, which is near a part of the country that has recently experienced large algae blooms due to agricultural runoff into Lake Erie. The new molecule in the study was detected using equipment at the IU Bloomington Department of Chemistry's Nuclear Magnetic Resonance Facility, the Laboratory for Biological Mass Spectrometry and the IU Molecular Structure Center. Study co-authors are professor Krishnan Raghavachari, associate scientist Jonathan A. Karty, research associate Eric B. Twum, senior scientist Maren Pink and Ph.D. student Arkajyoti Sengupta, all of the IU Bloomington Department of Chemistry. Pink is also director of the IU Molecular Structure Center. Karty is the manager for the Mass Spectrometry lab. Twum is a spectroscopist in the Nuclear Magnetic Resonance Facility. This study was first reported at the 11th International Symposium on Macrocyclic and Supramolecular Chemistry in Seoul, South Korea. The research was supported by the National Science Foundation. The cynostar macrocycle developed by Flood's lab is the subject of a pending patent filed by the IU Research and Technology Corp.